An outstanding example of the neo-Gothic architectural style, St. Gabriel's Episcopal Church was built in 1887 on land donated by J. Dunlin Perkinson, a lay reader for the mission, and by Mary E. Titus, the wife of Colonel Henry Titus. The church was to have been accompanied by a cemetery, however, the town council opposed the idea of a cemetery within the town's limits and it was never pursued. The wood-frame church is known for its stained glass St. Gabriel's window, which sends sparkles of light throughout the dark wood interior. In response to this gift, the members changed the church's name from St. john's to St. Gabriel's in 1888. 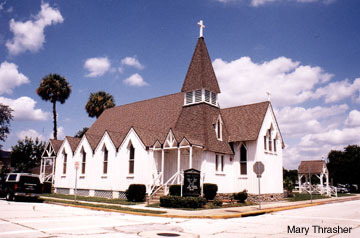 The large steeple houses a bell donated by the ladies of the church and installed in 1892, which is said to be the largest in Brevard County.